today, i'm guest posting over on lauren's blog choosing joy and i'm sharing this cookie recipe! 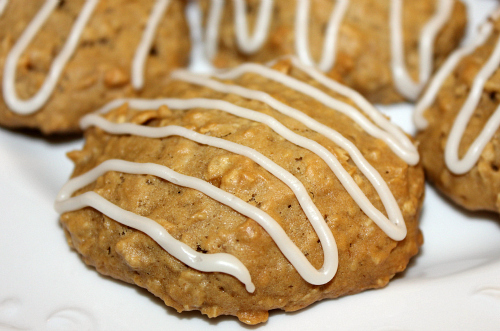 traditional oatmeal cookies are a favorite of mine for sure. however, from time to time, i like to switch things up a bit when it comes to traditional recipes. i made these oatmeal-applesauce cookies and took them to work recently for my co-worker's birthday. the addition of the applesauce makes these cookies soft. 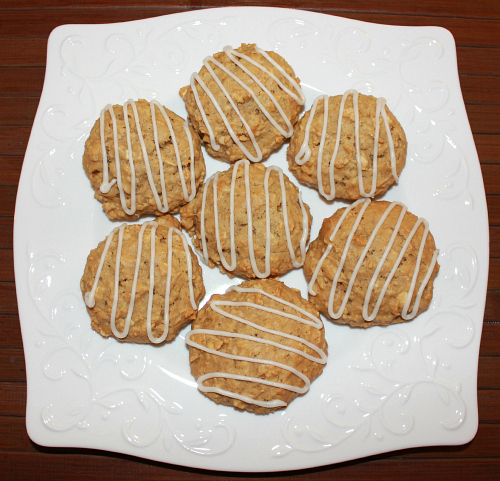 they are different than traditional oatmeal cookies since they have a cake-like consistency. the glaze gives them a bit of sweetness without being overpowering too. everyone at work loved them as a little snack to go along with their morning cup of coffee. be sure to check out my guest post and recipe here! to make the cookies: preheat your oven to 350 degrees F. in the bowl of an electric mixer, beat the butter and sugars together until combined. add the egg and applesauce and beat for 2-3 minutes. in a separate bowl, sift together the flour, baking soda, baking powder, and cinnamon. add the sifted flour mixture to the batter along with the oats and mix until combined. line a cookie sheet with parchment paper and scoop 1 tablespoon-sized balls of dough onto the cookie sheet. bake for 14-15 minutes, until the cookies are golden. allow the cookies to cool completely before drizzling them with the glaze. to make the glaze: whisk together the maple syrup and the powdered sugar with 1 tablespoon of cold water. add additional water as needed to reach the desired glaze consistency. drizzle the glaze over the cooled cookies, and let the glaze dry completely before serving. They look delicious and they were. Nice presentation with the icing drizzled.